This is the same Eli Manning that told the Chargers not to draft him because he didn’t want to come to San Diego. After the draft during an interview with David Letterman he admitted he had never even been to San Diego. Wait a minute, you have never been to San Diego, but you don’t want to be here? Talk about a slap in the face. One thing that all San Diegans are passionate about is San Diego, America‘s Finest City and that also let us know that Eli probably wasn’t the smartest guy around as well. Reading between the lines, it looked like Eli didn’t trust the front office people to surround himself with the talent to win. At that point at the rate the Chargers were going he probably had some merit with that argument; however, that draft is what created a monster of a GM that we now know as AJ Smith. Did things turn out well for the Chargers and the Giants? Absolutely! The Chargers got three pro bowlers for one, to simply compare Eli vs. Rivers when grading that draft isn’t fair, we need to give credit where it is due and this is AJ Smith’s shining moment. With that said, let’s look at the game. Road Warriors – Under Norv Turner the Chargers are a horrible road team, (2-8) when they are not playing teams in the AFC West. The Chargers have won only two regular season games in the past two seasons (vs. Bucs 2008, vs. the Titans 2007). I get the feeling that Norv runs a pretty loose ship when the team is on the road and the results on the field reflect that. Brandon Jacobs – The Chargers are 27th vs. the run, Jacobs is due to breakout, Bradshaw is going to cause fits with change of pace. I’m waiting to watch Cro when Jacobs comes running his way, pure entertainment. It is how you start AND how you finish – The Chargers scored on an opening drive last week for the first time in ages. 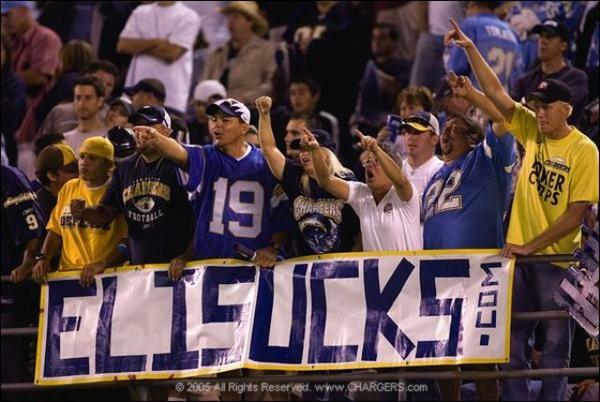 The Chargers need to repeat that today, score early, score often. They need take a page from the Saints and Eagles, throw, get ahead and force Eli to beat you. Eli Manning – Hit him, hard and often! I haven’t seen good push from him on the deep ball since the foot injury. Easiest way to hurt a QB’s accuracy is to hit him! Philips and Merriman need to build off last two games. Expect the Giants to be prepared for Corner and Safety blitzes. Chargers O-Line vs. Giants pass rush – After Norv abandons the run game…midway through the 1st quarter expect Rivers in the Shotgun formation. The Giants will exploit Vasquez and Clary, look for the middle blitz that has eaten up the Chargers all season long. Rivers need to make sure he secures the ball when he feels the rush. Jet Lag– This game is the late game, just as if it were in San Diego. This gives Coach Norv Turner the unique opportunity of not letting the time change have and affect on the team. No jet lag, don’t change your clocks, keep everything on west coast time! Meetings, walk through, curfew! Will he do it? Of course not, this is why the team is 2-8 on the road under Tuner. Bold Prediction – Giants 35 vs. Chargers 27. Chargers score in garbage time to make it close.